As the gyms get busier and busier and the healthy eating is kicking in again in preparation for the summer, we would like to introduce our new New Anti-Cellulite and Adipose Fat Oil, Lipogen AC. To support this exciting launch, we have held an interview with Kamilla Schaffner, Clinical Nutritionist, who specialises in difficult weight loss, to talk about fat reduction utilising nutrition. What is the difference between what you do and what’s out there? What is the value of a varied and healthy diet as part of a weight loss plan? What tips would you give to a person wanting to shed a few pounds? What typical diet would you recommend to a person looking to lose a stone or more? What is the importance of including body skin care products in a slimming programme? “Body skin care products and body care routine are immense factors in all slimming regimes. Strangely, people always link it to extended expression of vanity, but guess what, vanity is immensely important and vanity pulls people through at the most difficult and darkest of weight loss points. ‘Treat’ yourself with targeted key products, not another piece of chocolate cake or a glass of your late night usual. Vanity or rather a healthy desire to look and feel your best is the utmost important antidote to patients’ typical decades-long embedded behavioural codes that are otherwise very difficult to overwrite. Overwrite your urge to binge on box of biscuits with a mineral salt bath and an amazing slimming, tissue oxygenating or fat-stimulating cream or treatment. Perhaps there will be no instant ‘right here, right now’ gratification but effects of certain products are very deep penetrating not only on dermal levels but also the way they make you feel on a subliminal/ subconscious level which is way more important than any quick emotional stimulation any candy bar can give. 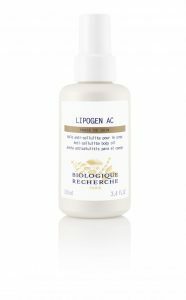 Combining the effects of both Complexe Anti-A and Complexe Anti-C, Biologique Recherche has developed a new formula to get rid of localised excess fat and cellulite, and visibly improve the “orange peel” effect, Lipogen AC. The composition of this multi-purpose oil for the body, rich in lipolytic and draining active ingredients, helps boost lipolysis and thermogenesis while facilitating the activation of micro-circulation and the disposal of waste. In turn, the reduction in the number of adipose and aqueous cells contributes to alleviating fibrous cellulite. After use, the figure is redefined and the skin regains its firmness and smooth appearance. Combines both chemical and mechanical exfoliation to tone, revitalise and unify the skin. Ideal before a slimming cure. With smoothing and exfoliating ingredients to invigorate and reduce adipocyte volume. Ideal for all Skin Instants® with confined areas of accumulated fat. This body contouring cream also comes with a multi-action silicone glove that is very easy to manipulate around the contours of the body, in order to enhance at home results. Contains slimming and detoxifying agents for lasting regenerating and firming effects. Ideal for Skin Instants® with localised very stubborn adipose fat or damaged skin. This body cream also comes as a coffret with the Massage Glove. Enjoy our body treatments at Beauty M in Fulham or Clapham, London. Exfoliates and restores a healthy glow. Improves firmness and re-sculpts the figure. Includes: Anti-C Slimming Programme and BR Drainage Treatment. Purifies the skin whilst incorporating an energising massage to tone and firm the figure. Includes Gel d’Algues Detoxifying Treatment and Auto-Heating Algae Slimming and Detox Treatment. Breaks down fat, eliminates excess water and boosts the effectiveness of slimming active ingredients. Ideal to prepare slimming action and boost the performance of subsequently used creams. Contact us to find out which body product and treatment would be the most suitable for you.